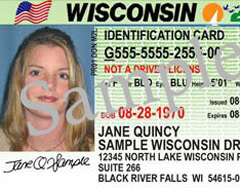 Some states adopt a "no-smile" policy in driver&apos;s license photos; will Wisconsin be next? New facial-recognition software compares new photos with a data base of older pics in an effort to prevent identity theft and driver&apos;s license fraud. Some officials claim this high-tech system works better if all faces have a neutral expression, but not here at Wisconsin&apos;s Department of Motor Vehicles . "We&apos;re in routine communication with our vendor and they have never notified us that they&apos;re having difficulty performing the searches or getting a lot of false positives because of someone smiling, so we&apos;re not in a position now to tell someone that they shouldn&apos;t."
Kristina Boardman, Director of DMV field services, says go ahead and smile. Their four-year-old software works fine, whether or not you show your pearly whites. "And it works fine and we&apos;ve never had to tell people that they can&apos;t smile, so." Besides, Boardman says, it&apos;d be pretty difficult to wipe that smirk off the face of a 16-year-old kid getting a driver&apos;s license for the first time. NOTE: The four states ordering people to stop smirking at the DMV are Arkansas, Indiana, Nevada and Virginia.